The Hunger Project Bangladesh has commenced a new project ‘MDG Union: Building Participatory Democracy From the Bottom Up in Rural Bangladesh’,funded by The United Nations Democracy Fund on 2 May, 2013. This project is being implemented by THP in partnership with BRAC. The project will build on recent legal reforms to demonstrate that improving governance at the local government level (the Union Parishad or UP) by building the capacity of the UP representatives and Government functionaries, and uniting it with an active, mobilized citizenry, particularly through implementation of the village assembly (Ward Shava),can accelerate progress for social and economic development.The project will work to promote the results throughout the country in partnership with local and national media. 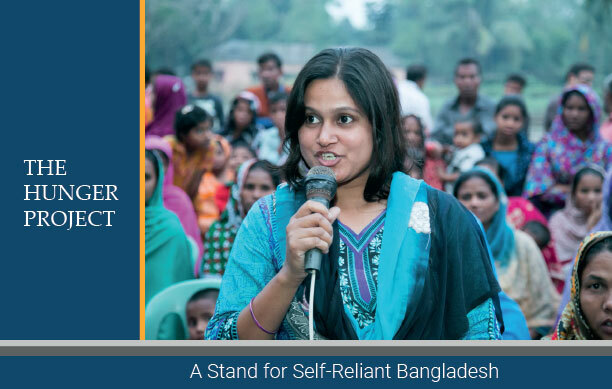 The objective of the project is to strengthen the institution of democratic local government in Bangladesh, by demonstrating to policy makers that stronger Union Parishad, working in partnership with a mobilized,active citizenry, can accelerate the achievement of the MDGs. 1.The capacity of the UP representatives and functionaries strengthened and the knowledge of rights,entitlements and responsibilities of public and youth developed for improving democratic local governance, and active citizenry. 2.The local civil society, especially women, are empowered for increasing their participation in public space, demanding transparency and accountability and, taking action to reduce violence against women and the achievements of MDGs. 3.Experiences and lessons learned regarding the difference that stronger Union Parishads and regular Ward Shavas can make in development are expansively covered in media to influence public opinion and policy actors. The length of the project is two years long which commencing from May 1,2013 and ending by April 30, 2015. The project will be implemented in 10 Unions of Mymensingh and Tangail districts under Dhaka division. 4. Support to hold Ward shava and open budget meeting effectively. 9. Disseminate the good practices and learns using multi-mode of media to influence public opinion and policy actors. Many of the activities have been carried out by THP, using different distinctions, across 800 Unions over the past 20 years, however in the past three years BRAC has funded THP to pilot this approach in 4 Unions. This project has built on that experience, adding more intensive ward shava mobilization, local level planning and publicity through press conferences.